G-force (gravitational force) is the force pulling an object toward the center of the earth. Normally, we are suffering a 1G when we are stationary. When a car is cornering or accelerating, the driver suffers more than 1G; a 10-pound human head will weigh 30 pounds under 3G acceleration. A golf swing is about 5000 Gs; therefore, do not wear an mechanical watch when playing golf. According to the ISO 1413 standard, the shock resistance test is conducted by using a pendulum impact testing machine. The mechanism sets off a circular movement which brings the pendulum to hit the watch. When the watch is hit by the pendulum, the watch will "fly" at the presetted acceleration, e.g. 5000 Gs. 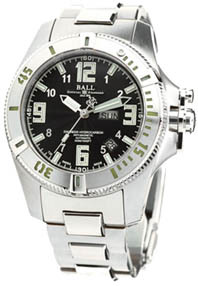 1st shock is directed against the side of the case, parallel to the plane of the watch, on the 9 o'clock side. 2nd shock is directed against the glass, perpendicular to the plane of the watch.